Short Cut Program Generator (SCWin) is a free, menu-driven, PC-compatible software package that simplifies the creation of data logger programs; it creates a data logger program in seven easy steps. To download Short Cut, refer to the Downloads section or click the Download Now button. Generates a printable wiring diagram. Supports both standard sensors and generic measurements (e.g., bridge, pulse). Supports the AM25T, AM16/32B, AM16/32A, AM16/32, AM416, and AM32 multiplexers. Suports the AVW200 2-Channel Vibrating-Wire Spectrum Analyzer. Supports ET106, ET107, and MetData1 Weather Stations. Includes a reference crop evapotranspiration calculation module and other mathematical calculations. October 3, 2016: The CS526 Digital ISFET pH Probe was incorrectly included as being compatible with the CR300 datalogger. In a future Short Cut release, the CS526 will be removed from the sensor list. The user will be required to update his/her Short Cut software to eliminate the sensor from the list. Originally intended to support meteorological and hydrological applications, the initial releases of Short Cut (SCWin) supported over 120 sensors. Now, with additional program generation capabilities, Short Cut supports programming for our multiplexers, AVW200-series Vibrating-Wire Interfaces, ET107 stations, ET106 stations, MetData1 stations, and most sensors that can be measured by our data loggers. Short Cut allows the user to select sensors and choose output data. Short Cut then creates a wiring diagram and a program file for transfer to the data logger. It also includes support for algebraic entry of expressions. Computer operating systems—Windows 7, 8, and 10. Short Cut runs on both 32-bit and 64-bit versions of these operating systems. Where is there information about the revisions to the SCWin software? The SCWin revision history information can be found through the “Software and OS Revision Histories” web page for Short Cut. Can Short Cut be used to make a CR1000 or CR3000 with an NL120 push data to an FTP? No. 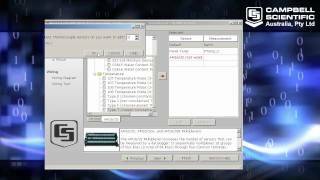 Short Cut version 3.0 cannot be used to program the data logger to send data via FTP. Other than by using the CRBasic Editor or Edlog, is there a way to remove the Default sensor and its measurements (for example, BattV, PTemp_C, and ProgSig) from SCWin? No. Campbell Scientific recommends tracking the battery voltage, program signature, and data logger temperature over time for troubleshooting purposes. No. A CRBasic or Edlog data logger editor (included in PC400 and LoggerNet software) is needed to write program code for the TDR100. Short Cut for Windows (SCWin) is not designed to handle the many variables of the TDR100. 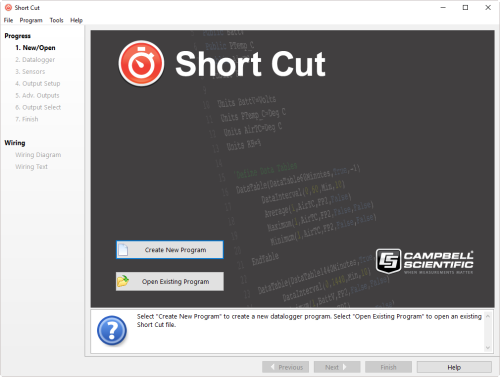 Short Cut for Windows (SCWin) ships in all of Campbell Scientific’s support software packages. It is also available as a free download in the Downloads section of the SCWin product page. SCWin can be used to create programs by going through a simple five-step process. The generated data logger program can be used “as is,” or it can be opened up in the CRBasic Editor (the programming editor that is included with RTDAQ, LoggerNet, and PC400). SCWin provides a good example of programming, as well as a head start on a new program. Note that any changes made to the CRBasic program cannot be imported back into SCWin. We do not offer an individual manual for SCWin (Short Cut for Windows). Short Cut information is provided in the LoggerNet, RTDAQ, and PC400 manuals. Information can also be obtained from the Help screens within SCWin.